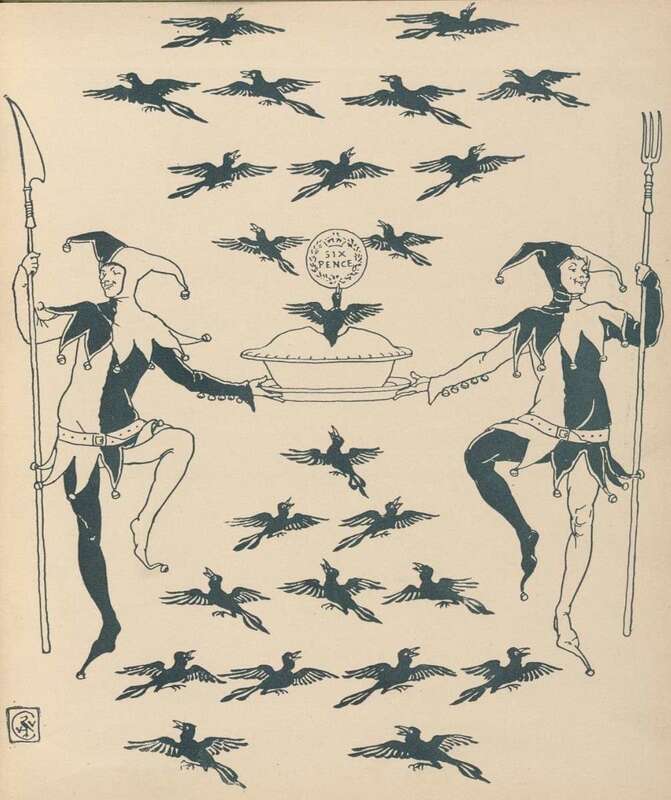 We are all pretty familiar with this little nursery rhyme from when we were children, but did you know that they would actually put birds in a pie as a great joke or form of entertainment? How in the world did they do this? Well in medieval times the way they made pie crusts was a little different than in present time. The crust was thick, and could be baked first, and would rise forming a pot, hence the term "pot pie." The lid would be removed from the pie, and the birds would then be set inside, the lid put back on, and then this wildly entertaining dish placed before the host of the party. So these birds were not actually cooked in the pie. Cooks would get quite competetive at feasts, and try to outdo other lords and ladies' cooks. It is said that not only were birds baked into pies, but rabbits, frogs, dogs, dwarfs (who would pop out and recite poetry) and at one time a whole little musical group. Not unlike how we may have people pop out of a cake. If you watched the Tudors on Showtime last season, Henry presented a blackbird pie to the King of France. a large round cookie tin, approx. 9 1/2" diameter x 3 1/2" deep, lined with greased heavy-duty aluminum foil. Optional: 1 egg yolk, mixed with 1 tablespoon water; cloves for garnish Making the Dough. Boil the water and salt in a large pot. Add lard, and stir until melted. Place 6 lbs. of flour in a large bowl (reserve the remaining 6 lbs. of flour), and make a well in the center. Add the boiling water mixture to the flour, a little at a time, and stir with a wooden spoon to mix thoroughly. When all the water has been added and stirred in, and the mixture has cooled slightly, take up small handfuls of the dough and knead on a floured board until the mixture is smooth and can be formed into a ball. Set the balls aside in a large bowl, and cover them with a damp cloth until all the flour mixture has been kneaded. Let rest a few minutes. This rest will make the dough more elastic, and easier to work with. Making the Shell. Form about half the dough into a large ball. Roll it out, at least 1/4" thick, on a lightly floured surface to form a 21" diameter circle. Line the mold with this circle, pressing it firmly into place. Trim the excess dough, leaving at least 1" hanging over the edge. Cut a 4" diameter hole in the base of the bottom crust. Take the remaining 6 lbs. of flour and fill the pie. Mound up the flour in the center. Take a little more than half of the remaining dough, and form a ball. Roll it out to form a 13" diameter circle. Cover the bottom crust. Moisten and seal the edges. Trim away the excess, leaving about 1" hanging over the edge. Crimp the edges high. Poke a steam vent in the center of the top crust. Optional: brush the top crust with the egg yolk wash, and garnish with whole cloves. Bake at 400 degrees F. for 50 minutes. Reduce heat to 350 degrees F. and bake 30 minutes more, or until the crust feels hard when tapped. Remove from oven and let cool. When cool, remove the crust gently from the mold. You may separate the top from the bottom crust before service, so as not to injure the birds during presentation. The top crust can be re-attached using toothpicks. Remove the flour from the center of the pie (it will have caked, so carefully use a metal spoon to loosen it). If the bottom crust is still spongy to the touch, return the crust to the mold and bake for an additional 20 minutes at 400 degrees F. Remove from oven and cool completely. Presentation. When the shell is completely cold, and just before you are ready to serve, you may gently insert live birds (or frogs, etc.) into the crust via the hole in the bottom. Place the pie on a serving platter, and garnish as you wish. Serve immediately. Usually the cook would have another pie waiting on standby for eating. If you are a writer like me, it would be a fun chapter to add into the book, perhaps the bird will bite off the nose of villain... Or the heroine will surprise her hero with such a fun treat! It's amazing what they went through for the sake of entertainment, isn't it? "Garnish as you wish ... serve immediately." This is a wonderful blog, Eliza! I would not be surprised...poor things! What if a few dwarfs had the same fate? How terrible! Great post! I just watched that Tudors show with the blackbird pie and wondered how they did that! Thanks for the info!